I'll be moving some of my favorite posts from here to there and my blogging will be done there from here on. Please visit me there! Anyone who has linked to this blog, please update the address. Google officially opposes Proposition 8. As a consequence, I will no longer be using their services. This blog, unfortunately, is owned by google. I will, therefore, be closing down and moving my blog to a different owner who does not publicly push the gay agenda. If any of you who support Prop. 8 have a blog with blogger.com, I would suggest you do the same. Google is making money through our blog usage. The money they make is then used to support a cause we don't believe in. PS I will shortly announce where my new blog will be located. First, does this scripture seem to imply that the Zoramits were familiar with human sacrifice? Second, Does this fit into a Mesoamerican, Ancient Near East, or 19th century rural USA world view best? Well, Connecticut has joined the club. When will judges stop legislating from the bench? Is the constitution hanging by a thread? Here is a rough draft of the paper I'll be presenting this November at the Sane Symposium. It is a rough rough draft. So, it has a way to go still, but I thought I'd show you what I've been working on. I recently bought all 6 volumes of Second Witness: Analytical & Contextual Commentary on the Book of Mormon by Brant A. Gardner. I've only read about 100 pages of the first volume so far, but I am highly impressed. I do not agree with every take Brother Gardner has on different issues, but I have found it very insightful with very useful information and references. It's like someone has pulled together into one place all of the scholarly information on the Book of Mormon. I highly recommend it. As Lehi prayed, he beheld a pillar of fire dwelling upon a rock in front of him. From this pillar Lehi saw and heard many powerful things, but Nephi does not elaborate on who or what Lehi saw in this pillar of fire. Joseph Smith described how God, angels, and spirits appear in fiery manifestations; he taught, for instance, "spirits can only be revealed in flaming fire and glory." From ancient sources, too, one learns that the appearance of fire, especially a pillar of fire, was a frequent mode of heavenly manifestation, sometimes of God and other times of his messengers or of the holy beings who surrounded him. (Cited in Gardner, Second Witness, Vol. 1, page 68). After reading this, something came to my remembrance--Joseph Smith's first recorded recollection of the First Vision. [T]he Lord heard my cry in the wilderness and while in < the > attitude of calling upon the Lord < in the 16th [15th?] year of my age > a pillar of fire light above the brightness of the sun at noon day come down from above and rested upon me and I was filled with the spirit of god and the < Lord > opened the heavens upon me and I saw the Lord... (Joseph Smith, "A History of the Life of Joseph Smith," in Joseph Smith Letterbook 1). The Prophet struggled to describe what he saw. He first wrote that he saw a "pillar of fire" but then crossed out "fire" and replaced it with "light." On another occasion he related his experience to the "prophet Matthias" who claimed he was "Joshua the Jewish Minister:"
This isn't earth shattering or anything, just thought it was interesting that Joseph Smith's accounts of the vision, like Lehi's account in the Book of Mormon, accurately portray the pillar of fire concept. I recently bought Hugh Nibley's latest book entitled "Eloquent Witness: Nibley on Himself, Others, and the Temple" (See HERE). It's a good thing that something so little as death hasn't slowed Brother Nibley's publishing down! Let me give you a little preview of the Book here. MIDGLEY: Are you concerned with the leadership of the Church? NIBLEY: Nope, not a bit. I certainly am not. The leadership of the Church is Jesus Christ, and he know what he is doing. Don't worry. MIDGLEY: I am tempted to ask you if you would sustain Judas? NIBLEY: Of course I would sustain Judas. He was on of the apostles. MIDGLEY: But he was a devil. I really like this philosophy. I've had church leaders before who really didn't see things the same way I do. Some of the "brethren" at times have seen things differently than I do. I'm not saying that any of them are "Judas" (so to speak), but should I not sustain them? Isn't it Jesus' Church? If Christ calls someone who isn't perfect, or even someone who is wicked, to a position over me, who am I to oppose it? When Jesus met Simon son of Jona, he gave him a new name--Cephas. "Cephas" (Aramaic--kefa) is the equivalent of "Peter." The name means "stone." According to Hugh Nibley, kefa is an Aramaic word that refers to a green crystal used for divination. In other words, kefa doesn't just mean "stone" but more precisely it means "seer stone." The Joseph Smith Translation of John 1:42 is more interesting now, isn't it? "And [Andrew] brought [Peter] to Jesus, and When Jesus beheld him, he said, Thou art Simon the son of Jona: thou shalt be called Cephas, which is, by interpretation, a seer, or a stone..."
Is Hugh Nibley right about kefa? If so, how do you explain Joseph Smith's uncanny ability to get these things right? Not only do LDS believe that we must study LDS teachings out in our mind before we can receive confirming revelation from God, but the scriptures teach that revelation comes to our mind. I have found that one of the ways I can distinguish personal revelation from my own thoughts or emotions is by noticing if the revelation comes to my mind and my heart. I ask myself, Does it makes sense? Does it seem right? Does it enlighten my understanding? Does it taste good? To say that the mind or understanding has no place in the "Mormon testimony" is another false caricature of anti-Mormons. Mormonism teaches that "studying it out in your mind" is a prerequisite to gaining revelation that comes to "the heart AND the mind" and that "enlightens our understanding." It's not "just feelings." What awful scenes are acted here below! From “freedom’s ground”-from Carthage prison walls! Of Prophets martyr’d for the truth of God. For the pure blood of innocence, thou’st sown? That grac’d thy surface, O degraded Earth! Oh wretched murd’rers! fierce for human blood! Who’ve borne oppression from their early youth. To plant on earth, the principles of truth. Are butcher’d while submissive to her laws? That has defied the laws of God and man! Against the laws they never did rebel. Has prov’d an instrument of cruel death! Thy boasted freedom-thy protecting care? When they’re exerted in the Saints’ defence. Against the best, the noblest of mankind! Spread utter destruction through the land? Shall freedom’s banner be no more unfurled? Has peace indeed, been taken from the world? Make bare thine arm to break oppression’s yoke. Is like the sun-beam, spreading o’er the earth. The Prophet and Patriarch are dead! Since Calv’ry’s scene, has laid the brothers low! Then seal’d their testimony with their blood. Are mingled with the helpless orphans’ moans! And with his judgments on this guilty land! The cause of Zion in the courts above. Eliza R. Snow, “The Assassination of Gen’ls Joseph Smith and Hyrum Smith, First Presidents of the Church of Latter Day Saints; Who were Massacred by a Mob, Hancock County, Ill., on the 27th of June 1844,” Times and Seasons, July 1, 1844, 575. 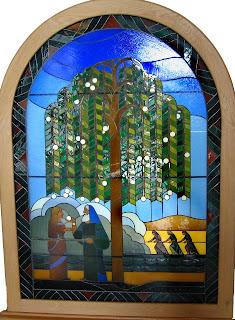 Lehi saw a vision of the Tree of Life (See 1 Nephi 8). In his vision he saw some pressing forward until they arrived at the tree and tasted its fruit. Some of them "after they had tasted of the fruit...were ashamed, because of those that were scoffing at them; and they fell away into forbidden paths and were lost" (1 Nephi 8:28). Wherefore, the wicked are rejected from the righteous, and also from that tree of life, whose fruit is most precious and most desirable above all other fruits; yea, and it [i.e., the fruit] is the greatest of all the gifts of God (1 Nephi 15:36). This should make any LDS seminary graduate to raise his eyebrows. What is the greatest of all the gifts of God? The Doctrine and Covenants states that "eternal life...is the greatest of all the gifts of God" and also that "there is no greater gift than the gift of salvation" (14:7; 6:13). So salvation or eternal life is the greatest gift a child of God can receive, and this is synonymous with the fruit of the tree of life! So, apparently some can partake of the fruit of the tree of life (which is eternal life or salvation) and then fall away. Since this life is the time to prepare to meet God, and since salvation cannot be lost after death, in what ways can we partake of eternal life and salvation in this life? PS. There are a few Biblical references to having "eternal life" in this life. I won't point them out to you specifically, but they're there. This is a letter I wrote and sent a couple of years ago while living near Lexington, Virginia. I never received a response or acknowledgment of any sort. I might add, I tried to use the same sort of rhetoric and judgment passing that their tract contained in sort of a mocking way. I don't know if it really came through. “Thou shalt not bear false witness against thy neighbor.” Thus God’s voice thundered from Mount Sinai. I write this to you in a spirit of meekness, kindness and out of pure love. As custodians of the truth of God, at times it is expedient to reprove the sinful actions of others out of love and concern for the salvation of their souls. It is in this spirit that I write this letter to you. As followers of Christ, I am confident that you will take the time to read and respond to this letter. Yesterday, May 27, I discovered a tract published by the Fellowship Tract League on the shelf at a local business entitled “Mormonism has Another Jesus.” It is an unfortunate and misguided attempt to explain the basic tenets of The Church of Jesus Christ of Latter-day Saints and to arouse feelings of hatred and misunderstanding towards Mormons. I will here address a few of the many inconsistencies and false witness found in this tract. You may believe Mormonism to be a false religion, and it is by all means your right to preach against it, but I believe it to be sinful to do so by purposeful manipulation of the facts and through lies. Our Lord is the only mortal person ever born to a virgin...Modernistic teachings denying the virgin birth are utterly and completely apostate and false (Mormon Doctrine, 822). As you can clearly see Mormons do not believe that the Father and Mary had sexual relations. She was a virgin and any other teachings are considered “utterly and completely apostate and false.” Now, the tract says Mormons believe otherwise. Is this done in ignorance of the clear and unequivocal statement found under “Virgin Birth” in Mormon Doctrine? If it is not done in ignorance, then the author of the tract is purposefully baring false witness against his neighbor. If it was done in ignorance, then the error has now been brought to your attention and you are compelled to correct it or you will now be baring false witness with full knowledge of the truth. I call upon you to correct the tract and/or repent or you will be held responsible before Almighty God. The tract continues to be deceitful when it states, “to a Mormon, Jesus is merely ‘an important member of the Godhead.’” The obvious use of the word “merely” is to imply that Mormons reject that Christ is fully divine or that He is God. However, this is not true. The use of quotation marks makes it appear to be some sort of a citation of a LDS reference, however it is not. However, this is clearly not the case. The Book of Mormon states in very clear terms that “JESUS is the CHRIST, the ETERNAL GOD” (Title page), “the Lord Omnipotent who reigneth, who was, and is from all eternity to all eternity” (Mosiah 3:5), “The Father of heaven and earth, the Creator of all things from the beginning” (Mosiah 3:8), “the very Eternal Father of heaven and of earth,” (Mosiah 15:4) and “God himself” (Mosiah 15:1), etc. The tract then compares the events, such as the earthquakes and storms, surrounding Christ’s death and resurrection in the land of Jerusalem and Israel with those events mentioned in the Book of Mormon that took place in the Americas. Obviously they are talking about two different places. It is a well established and scientific fact that everyone knows that you can have massive earthquakes, storms, fires, tornadoes, etc in one part of the world while the another part of the world might be passing through a time of complete peace and prosperity. There is no conflict in the two accounts for any rational and intelligent human being. This is a rather pathetic attempt to slander the Book of Mormon account in an illogical way in order to promote further misunderstanding. Once again, this is baring false witness. There are many more things that could be said and written about this tract. It is nothing less than lies, slander, and misrepresentation in print. The Jesus of the Bible spent his time lifting up those around him, caring for their burdens and bringing them peace. This tract represents, ultimately, a different Jesus than the Jesus of the Bible. It is full of hatred, lies, and is a poor attempt to tear down the religion of another. Have you not anything to offer? Wouldn’t it be better to offer what you have in an attempt to save the souls of man than to tear down what others have? In the name of the Lord Jesus Christ, the Jesus of the Bible, I call you to repentance or my testimony will stand as a bright witness against you at the day of the great white throne judgment. May you repent and may God have mercy on you is my humble and heartfelt prayer. PS. Please feel free to respond. I sincerely hope that you will correct the tract’s errors or to stop printing it. If not, lest I bear witness to God at the last day that you are guilty of false witness against my beliefs, please try to justify what the pamphlet says. Further, don’t try to tell me what I believe. I know what I believe. My beliefs, as a Latter-day Saint, are not accurately represented in the tract. My wife and I bumped into a young lady ("Kristi") with children at deseret book today. She related to us that her husband is associating with a polygamist sect and that she was looking for something to try to help the situation. A conversation ensued, we exchanged email addresses, and I sent her the following email. What would you add? My wife and I enjoyed meeting you and your children today at Deseret Book. I have thought long and hard about what book or material might give you the information you seek. What mostly comes to mind, however, are bits and pieces of stuff from here and there. I do not wish to intrude or violate your privacy in any way, but I wish to be as helpful as I can be in any way. By way of disclaimer, I do not pretend to have the answers to everything nor do I believe I have any right to tell you what to think or what to do except as you give me permission. You and your priesthood leaders are entitled to receive revelation and direction for you and your family while I am not. However, I sincerely believe the Lord often puts people in our path who needs our help or who we can help. So, I will try to offer any help I can if it be agreeable with you and the Spirit. Also, I do not believe I know more than you or am more informed in anyway. I do not wish to ever give you the impression that I'm talking down to you in any way. If I ever come across strongly, it's not meant to offend in any way. I know there are about a thousand things you're thinking about and trying to understand. Out of all of them, what would you say is the most troublesome? Testimony. As you research and study, you will uncover things you may not understand. That's okay! I've found that often I have much to learn and understand. Don't be afraid of new knowledge. However (and this is very important! ), don't discard what you do know because of what you don't know. I image that you, like myself, have read the Book of Mormon and have come to a conviction that it is indeed true. I imagine you have received a witness that The Church of Jesus Christ of LDS is Christ's true Church. Don't ever betray those things in a moment of uncertainty. This is the most important thing I could ever say to you on the topic. Authority. A basic and essential part of the gospel of Jesus Christ is priesthood authority. Priesthood authority comes by revelation and by the laying on of hands by those who are in authority before a person can administer the ordinances of the gospel (Article of Faith 1:5). D&C 42 is termed "the law of the Church." It defines church organization, practice, discipline, and so forth. One important, emphatic verse reads "Again I say unto you, that it shall not be given to any one to go forth to preach my gospel, or to build up my church, except he be ordained by some one who has authority, and it is known to the church that he has authority and has been regularly ordained by the heads of the church" (verse 11). This verse alone should destroy all pretense to authority for the splinter groups. "it shall not be given.." means not now, not then, not ever. All splinter groups claim authority from some secret ordination by a man or an angel when the Lord himself has said it cannot happen that way! One must receive priesthood authority from those who have been "regularly ordained by the heads of the church" not by some back room secret ordination. No matter what any one says, that is what our scriptures say and is the truth! Keys of Sealing Power. The keys of sealing power are held only by one person, the president of the church. D&C 132:7--"And verily I say unto you, that the conditions of this law are these: All covenants, contracts, bonds, obligations, oaths, vows, performances, connections, associations, or expectations, that are not made and entered into and sealed by the Holy Spirit of promise, of him who is anointed, both as well for time and for all eternity, and that too most holy, by revelation and commandment through the medium of mine anointed, whom I have appointed on the earth to hold this power (and I have appointed unto my servant Joseph to hold this power in the last days, and there is never but one on the earth at a time on whom this power and the keys of this priesthood are conferred), are of no efficacy, virtue, or force in and after the resurrection from the dead; for all contracts that are not made unto this end have an end when men are dead." Several things in this verse stand out to me. First, there is only one person who holds the keys of this power. It was Joseph Smith while he was alive. Today it is President Monson. No one else holds the keys! Second, it must be "by revelation and commandment through the medium of mine anointed [the president of the church]." Plural marriage can only be performed if a commandment comes from God to do so by revelation to the president of the church. That revelation came to Joseph Smith. The revelation to end it came to Wilford Woodruff and was confirmed and completed by Joseph F. Smith. If the practice were to return, it would be by revelation to the living president of the church who holds the keys. The Church not to Apostatize. Most splinter groups insist that the church has apostatized in some form or another. This contradicts the revelations of God, however. First of all, the dream recorded in Daniel 2 saw the coming forth of the Kingdom of God in the last days. It says "And in the days of these kings shall the God of heaven set up a kingdom, which shall never be destroyed: and the kingdom shall not be left to other people, but it shall break in pieces and consume all these kingdoms, and it shall stand for ever" (verse 44). The Church, according to this prophecy, will not be destroyed nor given to another people until the Millennial day which is approaching. "Brother [Heber C.] Kimball says you must keep alive, and give nourishment and vitality to the body, comparing the Church to a tree; that you must help your Prophet and Revelator and keep that portion of the tree alive. God keeps that alive, brethren and sisters. I thank you for your prayers, your integrity, &c., but I feel to-day as I did in Nauvoo, when Sidney Rigdon and others intended to ride the Church into hell. I told them that I would take my hat and the few that would go with me and build up the kingdom of God, asking no odds of them. If you support me, you support yourselves; if you do not choose to do this you will dry up, blow away and be damned....The Lord Almighty leads this Church, and he will never suffer you to be led astray if you are found doing your duty. You may go home and sleep as sweetly as a babe in its mother's arms, as to any danger of your leaders leading you astray, for if they should try to do so the Lord would quickly sweep them from the earth." (Brigham Young in Journal of Discourses, 9:289). In other words, God would sustain and "keep alive" the heads of the church without the help of the members. Further, He will not permit them to lead the church astray "if you are found doing your duty." Well, with polygamy, the church did it's duty. The brethren and sisters suffered great persecution, went to jail, struggled and toiled while defending that principle. It would be incredibly uninformed for someone to accuse them of not doing their "duty" when the Lord ended plural marriage. So why did plural marriage cease? "Wherefore I, the Lord, command and revoke, as it seemeth me good" (D&C 56:4). "Verily, verily, I say unto you, that when I give a commandment to any of the sons of men to do a work unto my name, and those sons of men go with all their might and with all they have to perform that work, and cease not their diligence, and their enemies come upon them and hinder them from performing that work, behold, it behooveth me to require that work no more at the hands of those sons of men, but to accept of their offerings" (D&C 124:49). The Lord gives and repeals commandments as his will according to the circumstances we find ourselves in. Many examples of this could be given. Let me know if you'd like a few. Not all statements by the Prophet are "prophetic." Joseph Smith said a prophet is only a prophet when acting as such. A friend of mine says "Catholic doctrine says that the Pope is infallible, and no catholic believes it. Mormon doctrine says the prophet is not infallible and no Mormon believes it!" The truth of the matter is that the president of the church is just as much human as you or I. While entitled to revelation for the church and although he holds the keys of the priesthood and kingdom of God, God doesn't give him a new brain, a new personality, or new philosophies when he becomes president of the church. So, if you study hard, you'll find that the prophets sometimes contradict each other and even themselves on some issues that are not core doctrines or principles of the gospel. This shouldn't bother any latter-day saint any more than seeing differences in opinion, personalities, and philosophies of our bishops, priests, elders, stake presidents, or anyone else. It's the same for the president of the church. Monogamy is the norm, not Polygamy. Lehi didn't practice polygamy. Neither did Nephi, Alma, Mosiah, Mormon, Moroni, Abinadi, Jacob [Nephi's brother], etc. The Lord actually forbade most polygamy among the Nephites (see Jacob 2). Paul forbade polygamy for elders and bishops (1 Tim. 3:2; Titus 1:5-6). However, Jacob 2:30 makes clear that the Lord may command it under certain circumstances. So, polygamy is not the norm, it is the exception. That is the scriptural fact, and that takes precedence over the opinions of any person. Polygamy not required for Exaltation. It follows that if many prophets and even whole dispensations did not practice polygamy, it can't be required for exaltation. Further, D&C 132:19-20 makes it clear that polygamy is not part of the formula for exaltation. "And again, verily I say unto you, if a man marry a wife by my word, which is my law, and by the new and everlasting covenant, and it is sealed unto them by the Holy Spirit of promise, by him who is anointed, unto whom I have appointed this power and the keys of this priesthood...they shall pass by the angels, and the gods, which are set there, to their exaltation and glory in all things, as hath been sealed upon their heads, which glory shall be a fulness and a continuation of the seeds forever and ever. Then shall they be gods, because they have no end; therefore shall they be from everlasting to everlasting, because they continue; then shall they be above all, because all things are subject unto them. Then shall they be gods, because they have all power, and the angels are subject unto them." "A man" sealed to "a woman" can be exalted, not a man sealed to "two or more women." Kristi, I hope some of this helps. We can't ever force another's beliefs, but we should do all we can to bring the truth to light (D&C 124:11-16). The only person's belief you can ultimately control is your own. I hope these things I have mentioned will help you first and foremost. So, what are the most troubling issues you are confronting? I thought I would try something a little different. Instead of posting on a topic, I would like you to discuss a topic. Does Revelation 22:18-19 mean there can be no more scripture after the New Testament? I thought a little humor around here might be appreciated. This should cause some real heart burn for Book of Mormon critics, and hopefully some real burning in the bosom, too. So, most of you probably had already read it when I started it a few weeks ago. It's one of those topics that didn't interest me very much for a long time. Recently, however, I decided to take it up. I must say, I've enjoyed it greatly. I think John L. Sorenson builds a wonderful case that the Book of Mormon took place in ancient Mesoamerica. For what it is worth, I highly recommend the book to any who doubt the Book of Mormon had a real setting in ancient America. Key 1: Be humble. Keep an open mind. Your understanding of the scriptures will change and increase in proportion to your humility and open-mindedness. Key 2: “Dig up the root and ascertain what it was that drew out the saying”--Joseph Smith. “I have a key by which I understand the scriptures. I inquire, what was the question which drew out the answer, or caused Jesus to utter the parable? [. . .] To ascertain its meaning, we must dig up the root and ascertain what it was that drew the saying out of Jesus. “And he spake this parable unto them— 'What man of you, having an hundred sheep, if he lose one of them doth not leave the ninety-and-nine in the wilderness, and go after that which is lost, until he find it? And when he hath found it, he layeth it on his shoulders, rejoicing. And when he cometh home, he calleth together his friends and neighbors, saying unto them, Rejoice with me; for I have found my sheep which was lost. I say unto you, that likewise joy shall be in heaven over one sinner that repenteth, more than over ninety-and-nine just persons which need no repentance.' The hundred sheep represent one hundred Sadducees and Pharisees, as though Jesus had said, 'If you Sadducees and Pharisees are in the sheepfold, I have no mission for you; I am sent to look up sheep that are lost; and when I have found them, I will back them up and make joy in heaven.' This represents hunting after a few individuals, or one poor publican, which the Pharisees and Sadducees despised. “He also gave them the parable of the woman and her ten pieces of silver, and how she lost one, and searching diligently, found it again, which gave more joy among the friends and neighbors than the nine which were not lost; like I say unto you, there is joy in the presence of the angels of God over one sinner that repenteth, more than over ninety-and-nine just persons that are so righteous; they will be damned anyhow; you cannot save them. (Jan. 29, 1843. )” (Joseph Smith in Smith, Joseph Fielding, Ed., Teachings of the Prophet Joseph Smith, pp. 276-278). Key 3: Correctly understand words. What does “conversation” mean in King James English? (See Psalm 37:14; 50:23; Galatians 1:13; 1 Peter 3:16; 2 Peter 3:11). What do the words “eternal,” “everlasting,”and “endless” mean? (See D&C 19:6-12; Moses 1:3) How does this clarify the meaning of “eternal life,” “the greatest of all the gifts of God?” Are the cities of Sodom and Gomorrah still burning (See Jude 1:7)? Key 4: Look for similar words/phrases. Key 5: Study the original languages. The Hebrew word yawd, translated as “place” in Isaiah 56:5 literally denotes an “open hand.” How does this knowledge change your appreciation for this verse? The word musterion translated as “secret” or “mystery” in the New Testament is a word used in ancient Greek to denote a “secret rite.” It translates into Latin as sacramentum, i.e. a “sacrament” or an “ordinance.” The word teleoi translated as “the perfect [ones]” and “the mature [ones]” was often used in ancient Greek to denote those who were initiated into the “mysteries.” The word sofia translated as “wisdom” was often used to denote heavenly or sacred wisdom that was given in connection with the “mysteries.” Read 1 Corinthians 2:1-8, 3:1-2; 4:1 (Note: The word “testimony” in verse 1 should be “mystery” according to the best manuscripts and is probably wrong in the KJV). How does this strengthen your testimony of the temple ordinances? “Jershon” is probably related to a Hebrew word meaning “inheritance.” Read Alma 27:22,24,26 and note the words “inherit” and “inheritance.” How does this strengthen your testimony of the Book of Mormon? Key 6: The Spirit of prophecy. “Prophets gave the scripture, and prophets must interpret it. Holy men of old received revelation from the Holy Ghost, which they recorded as scripture; now men must have the same Holy Spirit to reveal what is meant by scripture—otherwise there will be a host of private interpretations and consequently many different and disagreeing churches, which is precisely the condition in the religious word today”(Bruce R. McConkie in McConkie, Mark L., Ed., Sermons & Writings of Bruce R. McConkie, p. 82). Key 7: Who is addressed in the particular passage of scripture? “Christ says no man knoweth the day or the hour when the Son of Man cometh (Matt. 24:36). . . . Did Christ speak this as a general principle throughout all generations? Oh no; he spoke in the present tense. No man that was then living upon the footstool of God knew the day or the hour, but he did not say that there was no man throughout all generations that should not know the day or the hour. No, for this would be in flat contradiction with other scripture for the prophet says that God will do nothing but what he will reveal unto his servants the prophets (Amos 3:7). Consequently, if it is not made known to the Prophets it will not come to pass. Again we find Paul in 1st Thessalonians 5th Chapter expressly points out the characters who shall not know the day nor the hour when the Son of Man cometh. For, says he, it will come upon them as the thief or unawares. Who are they? They are the children of darkness or night. But to the Saints he says “ye are not of the night nor of darkness that that day should come upon you unawares” (Joseph Smith in Ehat, Andrew F. and Cook, Lyndon W., eds., The Words of Joseph Smith: The Contemporary Accounts of the Nauvoo Discourses of the Prophet Joseph Smith, pp. 180=181). Key 8: If possible, read the scriptures in a second language. Reading the scriptures in a foreign language generally requires more focus. It will give you added insights to passages that you might not have had in English. Key 9: Consult other English translations for the Bible for difficult passages. Let's be honest—sometimes King James English is as strange to us as a foreign language. Consulting a modern translation on difficult passages from time to time is helpful. Care must be given for translator biases, however. Some fairly reliable translations include the English Standard Version, the New King James Version, and the New Revised Standard Version. Key 10: Consult an inspired commentary. This is worth checking out: Trusting the Heart. In this truth is involved nothing less than the extension of Christ’s redeeming work to the dead....I allude of course to the famous passage...that ‘Christ...went and preached to the spirits in prison.’... Few words of Scripture have been so tortured and emptied of their significance as these...Every effort has been made to explain away the plain meaning of this passage. It is one of the most precious passages of Scripture, and it involves no ambiguity, except as is created by the scholasticism of a prejudiced theology...For if language have any meaning, this language means that Christ, when His Spirit descended into the lower world, proclaimed the message of salvation to the once impenitent dead. No honest man who goes to Holy Scripture to seek for truth, instead of going to try and find whatever errors he may bring to it as part of his theological belief, can possibly deny that there is ground here to mitigate that element of the popular teaching of Christendom against which many of the greatest Saints and theologians have raised their voices [that is, the exclusivist view]....We thus rescue the work of redemption from the appearance of having failed to achieve its end for the vast majority of those for whom Christ died. By accepting the light thus thrown upon ‘the descent into Hell’ we extend to those of the dead who have not finally hardened themselves against it the blessedness of Christ’s atoning work. We thus complete the divine, all-comprehending circuit of God’s universal grace (Farrar, Frederic W. The Early Days of Christianity, 2 Vols. [New York: Cassell, Petter, Galpin & Company, 1882] 1:139-143)! Farrar has given a wonderful insight, and I believe he is absolutely right: You destroy the doctrine of salvation for the dead and the concept of redemption has lost any real meaning and the very atonement of Christ has been made a mockery. This is so because the vast majority of people have never heard the gospel of Christ in this life. The following quote from St. Augustine should be of interest to LDS readers. I believe this indicates that some Christians even as late as St. Augustine believed that those who are saved will "become what [God] is" and that their "substance" will "be changed into the substance of God." The word "substance" should be interesting to anyone who has studied early Christianity. The early Christians used "substance" as a code word for "same nature." The Father, Son, and Holy Ghost are said to be of one substance, that is, each is of the same nature. Cessationism--Where have the Gifts Gone? In Christian theology, cessationism is the view that the charismatic gifts of the Holy Spirit, such as tongues, prophecy and healing, ceased being practiced early on in Church history. Cessationists usually believe the miraculous gifts were given only for the foundation of the Church, during the time between the coming of the Holy Spirit on Pentecost, c. AD 33 (see Acts 2) and the fulfillment of God's purposes in history, usually identified as either the completion of the last book of the New Testament or the death of the last Apostle. Its counterpart is continuationism. In other words, a cessationist believes the gifts of the Spirit have ceased since there is no more need for them. This individual I spoke with said that these gifts ceased because the apostles died and could no longer pass on these gifts to others. This idea is somewhat reminescent of the LDS concept of the apostasy. However, cessationists believe that it was God's will that these gifts cease since they have served their purpose. This individual further informed me that all we need is contained in scripture (i.e. The Bible). Cessationism is closely related to the (extra-Biblical!) Protestant doctrine of sola scriptura (See here and here and here). Of course, Latter-day Saints are not cessationists. One of our articles of faith states, "we believe in the gift of tongues, prophecy, revelation, visions, healing, interpretation of tongues, and so forth" (Article of Faith 7). Many, if not most, of us LDS have seen such gifts operate in the Church from time to time as needed. As a LDS I can point to slews of LDS scriptures that declare these gifts to be needed in the Church today as much as 2000 years ago. However, since my cessationist friend does not accept LDS scripture as valid, I will here investigate and analyze the Biblical passages that pertain to this topic. So, what passages are used to support cessationism? But when that which is perfect is come, then that which is in part shall be done away...For now we see through a glass, darkly; but then face to face: now I know in part; but then shall I know even as also I am known. This seems perfectly clear to me. "Then," when we will see "face to face" we shall no longer "know in part." Then prophecy, tongues, and knowledge will be perfect and cannot be added upon. Do we now know all things? Do we know all speak the same language? If not, then there is no warrant, according to this scripture, for the cessation of these gifts. Further, 1 Corinthians opens with a passage that clearly teaches continuationism. This scripture indicates that the gifts of the Spirit will be on earth until the second coming of Jesus who will "confirm" (Greek: secure, establish, strengthen) us until the end. Later in 1 Corinthians Paul exhorts us to "eagerly seek after spiritual gifts, most especially the gift of prophecy" (my translation of 1 Corinthians 14:1). When I pointed this scripture out to my cessationalist friend he responded that the verse refers to interpreting scripture. While my friend is welcome to interpret the passage this way, that is clearly a practice of eisegesis and not exegesis. In the same chapter Paul writes "Wherefore, brethren, with zeal seek to prophesy, and do not forbid speaking with tongues" (my translation of 1 Cor. 14:39). If Paul meant for these passages only to apply to the Corinthians of the first century A.D., he surely didn't say so. While this post certainly isn't exhaustive on such an important topic, I think it is sufficient to start a discussion on the topic if anyone is interested. As I mentioned previously, LDS scripture has a lot say about this topic. I will not investigate this here, but I point the interested reader to 2 Nephi 28:3-6, 26-31; 2 Nephi 29; Mormon 9; Moroni 7:24-38; 10:7-28. Anyone who does not believe that the gifts of the Spirit exist today would benefit greatly from reading these passages, pondering on their meaning, and seeking the truth of the matter. I do not desire to boast, for I have only been in the service of God. ye to labor to serve one another? O how you ought to thank your heavenly King! There is no doubt in my mind that this was intentionally done by the author. For the sake of argument, if Joseph Smith were the author and not the translator, did he come up with this poem intentionally when he "made up" the Book of Mormon? If so, why? Also, if so, why didn't he ever point out such beautiful complexities in the Book of Mormon (as there are many such complexities)? I suggest that Joseph Smith did not write the Book of Mormon. Further, I submit he didn't even know such complexities existed in the text. The Book of Mormon is far more complex than its critics are willing to admit. It is interesting that most of the criticisms leveled against that holy book are against its origins, and not its content. Isn't it time that the critics took seriously the complexity of the book as confirming evidence of its veracity? See more here: No Evidences for the Book of Mormon?